There is a productivity principle that what gets scheduled gets done. This concept has definitely been central in my both my personal and work life, and is even more important when the two connect. Meal times during work days, for example, are a non-negotiable break from the computer. Aside from Google Calendar, my other essential scheduling tool is Wunderlist, a beautifully-designed task management application that seamlessly syncs across multiple devices. It’s completely free to use, or you can upgrade if you want additional features. NOTE: Since I wrote this original post in 2014 for SteamFeed (now closed), Wunderlist was acquired by Microsoft, who are turning it into a new app called To-Do. The jury is still out on whether my favourite features will survive the transition. I have Todoist on the back burner, which I’ve heard is very similar to Wunderlist. It’s also comforting that I can easily import my data when/if the time comes. Though anyone can publish their thoughts online in an instant, effective blogging is not that simple. Before you even start writing a blog post, you need a marketing strategy, blogging plan, time for brainstorming, a place to capture random blog post ideas, and an outline you can build from later. After drafting, shaping, editing and decorating, your post is ready to publish. Then there is the social media promotion! You may have a set day you like to publish on your own site, or you have a specific submission date for your clinic site or a guest post. Either way, you need to make sure all those steps are completed in enough time to meet your goal. The last thing you want is to be rushing through the blogging process so you’re tempted to skip an important step like proofreading, adding links, or creating a compelling image. Scheduling your blogging time makes sure nothing gets missed. You already know that I think Wunderlist is beautiful, and that’s important to me. If I don’t enjoy the experience of using an app, I won’t use it consistently. If I do enjoy it, that tool quickly becomes entrenched in my day-to-day routines. Case in point: I started out using Wunderlist for business tasks, but now I also have a “Health and Household” list for assorted personal tasks, shopping lists for the stores I frequent, and even packing lists for trips! Because it syncs so efficiently across all my devices, Wunderlist makes an excellent idea catcher for Content Mastery Guide and the other sites where I blog. Wherever I am, I can add a new title or additional ideas to something I’ve already planned. I also appreciate how in Wunderlist I can sort and display my lists in different ways. For blogging, I display tasks in order of the due date. That way I can quickly get a snapshot of what I need to be working on next for each blog or client. Wunderlist also has smart lists like Today and Week, which display all tasks with due dates on those particular days. These help me stay realistic about what I can and will get done. I use the Today list every morning day to plan my time for the day, and on the weekends I use the Week list to plot out my tasks and adjust any due dates based on my available time each day. In addition to laying out the specific ways I use Wunderlist, I’ve included broader steps you can use in any scheduling system. Step 1: Batch your blogging tasks into scheduled blocks that make sense for you, and name those blocks. In Wunderlist, I have a separate list for every blog or client. 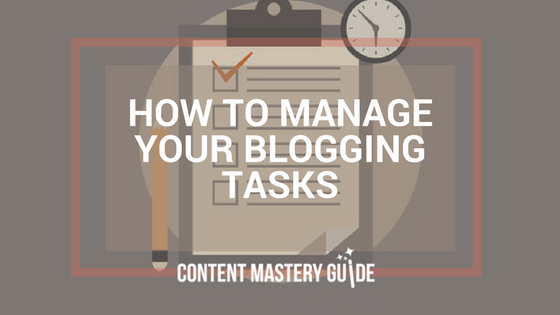 In the appropriate list, I create a list item with the name of the blog post, and then add the name of the block, e.g., How to Manage Your Blogging Tasks – initial draft. Step 2: Estimate the time you will need for each of those blocks. This may be difficult at first. Overestimate your time at the beginning, until you get a clearer sense of your own blogging workflow. I often use the Pomodoro Technique of working in concentrated 25-minute blocks, so sometimes I’ll add a hashtag to my Wunderlist item such as #2POM. That represents one hour, with a five-minute break in the middle. Sometimes I’ll also note whether this is ideally a morning task versus an afternoon task (#AM or #PM), though I can usually determine that in a split second when reviewing my lists and planning my work day. Step 3: Work backwards to schedule those blocks in enough time to meet your submission date. If you know you want to publish or submit on a Tuesday, and you’ve determined you’ll need three blocks of one hour each, you might start the whole process on the preceding Wednesday or Thursday. Your due dates for each blogging block will depend on what else is going on in your week, and when you typically like to do your blogging. If you’re lucky enough to have help with your blogging, you need to work those people into your schedule as well. If your editor or assistant typically needs a turnaround time of two business days, that means your final day to submit to that person must be two days ahead of your actual due date. In Wunderlist, once I’ve completed one phase of the blogging process, I revise the list item with the next block name and estimated time, and forward the task’s due date to the next date. For example, How to Manage Your Blogging Tasks – initial draft #2POM, becomes How to Manage Your Blogging Tasks – revisions #1POM. Sometimes I like to print out all tasks due on a particular day (the “Today” smart list). Sub-tasks take up more space on the page, often requiring a second page. If the block name is part of the task name, I can see it at a glance when viewing a list or smart list. To see sub-tasks I’d have to click through to open up a particular task. Whether you use Wunderlist or another task management system, if you want to keep blogging consistently and see results from your efforts, you must schedule time for your blogging tasks.